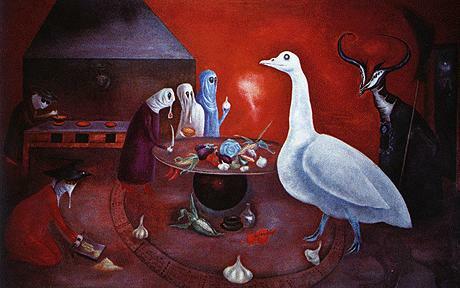 Leonora Carrington, Grandmother Moorhead's Aromatic Kitchen, 1975. Ever since I learned that Leonora Carrington died in May, I have been thinking about her. I first came across her work as an undergraduate art history student almost 20 years ago in a class on Surrealism. In the context of the traditional art history canon, she is mostly known for having run off with Max Ernst in 1937, but I immediately became intrigued with her work and her extraordinary life. She was a prolific painter and writer: her paintings are otherworldly and complex, sometimes disturbing – but in a good way. Populated with mythical beings in dreamlike surroundings, she created a world that seems imbued with symbolic meaning, yet defies any easy deciphering. Raised in a wealthy and conservative family in Lancashire, England, she was expelled from a number of finishing schools – the proverbial black sheep of her family. She agreed to appear as a débutante at the court of George V in exchange for taking art classes at Amédée Ozenfant’s school in London. It was through the school that she first met Max Ernst at a dinner party and suddenly she was living in Paris with the rest of the surrealists. Can you imagine? But World War II put an end to that idyll when Ernst was arrested in France. Unable to secure his release, Carrington had to escape into Spain where she had a nervous breakdown. Long story short, she was committed to an asylum, released into the custody of her nanny (whom her family had sent for her and who was charged with returning her to England), but then escaped her watch through a bathroom window in Lisbon where she fled to the Mexican Embassy, happened to run into a friend, the poet and journalist Renato LeDuc, married him on the spot and set sail for America. That kind of thing just doesn’t seem to happen anymore. After a year or so of living in New York City, she and LeDuc moved to his hometown of Mexico City where they parted ways amicably. Mexico was very friendly to European artists who fled the war, offering many of them citizenship and fostering a creative expatriate arts community that co-existed – not always happily – with the circle of Mexican artists surrounding Diego Rivera and Frida Kahlo. She spent the rest of her life in Mexico city, eventually marrying Hungarian photographer, Emeric Weisz, and having two sons. Although running off with Ernst, joining the surrealist movement and her movie-script escape from war-torn Europe is the stuff of biopics, it is her settling in Mexico that is most interesting to me. In her early days there, she became acquainted with a fellow refugee painter, Remedios Varo – who lived a similarly remarkable life – and the two of them forged an extraordinary creative friendship, much of which was played out in the kitchen. Both were interested in alchemy and magic – subjects popular with surrealists – but brought them into the domestic sphere. Much of her work – both painting and writing – deals with what is magical in the everyday. The early days in Mexico City were a struggle – money was scarce and she had few painting supplies. But Carrington and Varo had something else that – to me – was just as precious: time. They spent hours in one another’s kitchens collaborating on their writing and experimenting with food. Perhaps it is because I harbor a secret desire to run off to Mexico and paint, or perhaps it is because everything sounds better in the past (see “Midnight in Paris“), that I have completely romanticized their domestic idyll. Put on the corset and make it quite tight. Sit down in front of the mirror, relax your nervous tension, smile and try on the mustaches and hats according to taste (three-cornered, Napoleonic, Basque, Beret, etc. )… Run and pour the broth (which should be very reduced) quickly into a cup. Quickly come back with it to in front of the mirror, smile, take a sip of broth, try on one of the mustaches, take another sip, try on a hat, drink, try on everything, taking sips in between and do it all as quickly as you can. Haven’t tried this recipe yet, still rounding up the hats and looking for a corset, but the broth sounds delicious, don’t you think? To see more of Carrington’s work, click here. And to see more of Varo’s work, click here. Susan L. Aberth, Leonora Carrington (Lund Humphries Pub Ltd, 2010). Leonora Carrington, Leonora Carrington: The Mexican Years : 1943-1985 (La Tienda, 1992). Whitney Chadwick, Women Artists and the Surrealist Movement (Thames & Hudson, 1991). 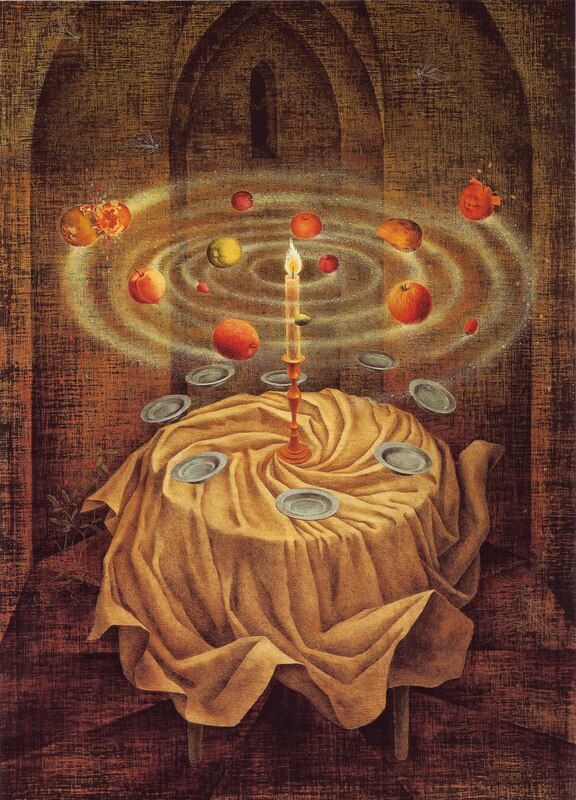 Walter Gruen, Remedios Varo. Catalogo Razonado. 4th edition, 4th ed. (Ediciones Era, 2008). Janet A. Kaplan, Remedios Varo: Unexpected Journeys (Abbeville Press, 2000). Sharon-Michi Kusunoki et al., Surreal Friends (Lund Humphries, 2010). Leonora Carrington, The Hearing Trumpet (Exact Change, 2004). This entry was posted on August 4, 2011, 9:27 am and is filed under inspiration, Kitchen Alchemy. You can follow any responses to this entry through RSS 2.0. You can leave a response, or trackback from your own site. This is awesome. Thanks for turning me on to two great artists. I want a whole cookbook of those recipes! Wow! Ever since I stumbled upon The Hearing Trumpet years ago at Gotham Book Mart, I’ve been fascinated by her. Thanks for sharing an aspect of her life that I’d not known before this.